Sports Illustrated: With the 2015 Canadian Football League in full stride in early August, here are some photos of the league’s cheerleaders, both past and present. [Click here] to check out the gallery. Time: Check-in: 12:30-1 p.m., Preliminaries: 1-3:30 p.m., Semifinal: 3:30-5 p.m.
Attire: Dance or athletic bra top, fitted dance shorts, dance shoes or runners. Wear hair and make-up as you envision wearing it on game day. Hair must be worn down. Criteria: You must be 19 years of age by July 1, 2015. You must be able to attend all rehearsals and other related activities. The auditions are also closed to the public for viewing. Additional information: Please arrive with enough time to warm up on your own before the audition. We will start with some across the floor exercises, including but not limited to: walks, high kicks, jete and pirouettes. You will have one hour to learn a one-minute routine similar to what we do on the field during home games. 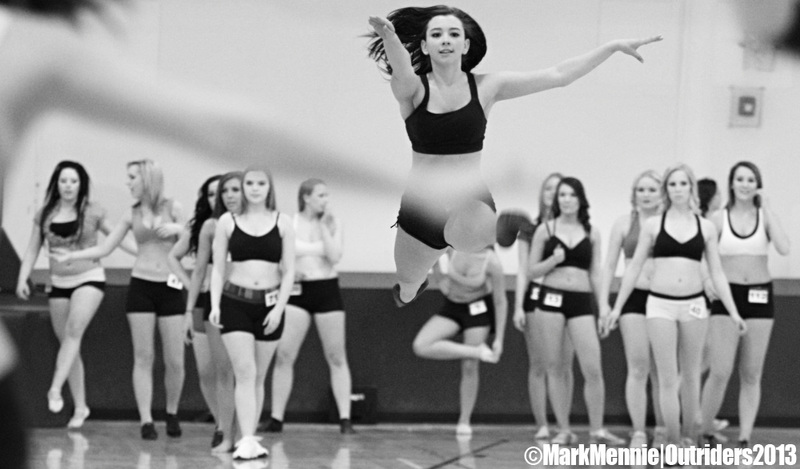 You will perform this routine for the judges in small groups, after which the first cut will be made. If you are invited to stay for the semifinals, you will be performing the routine in smaller groups for the judges. Those being invited to our 2015 training camp will be notified by noon the following day. 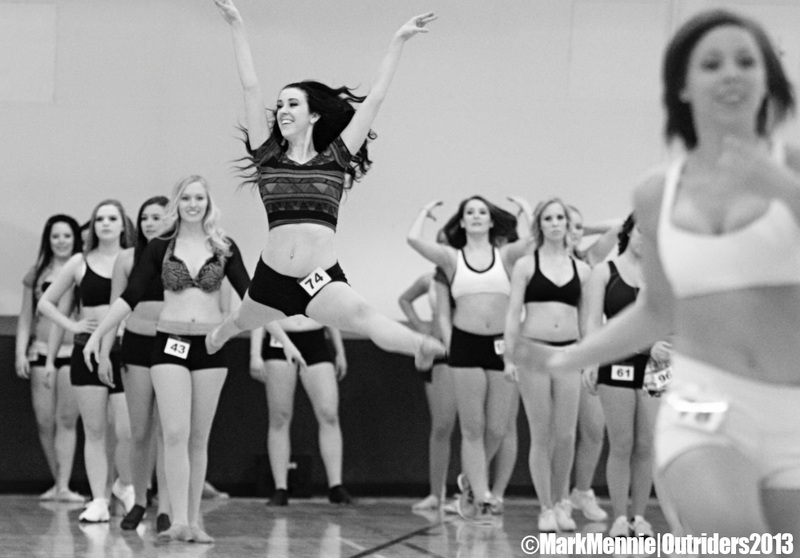 Kyla Findlay, Head Coach of the CFL Calgary Stampeder Outriders, tells us that Sunday’s open auditions were a big success. They are starting training camp later today and will have the final team picked by March 12. Attire: Dance or athletic bra top, short dance shorts (hot pants), dance shoes or runners. Wear hair and make-up as you envision wearing it on game day. Hair must be worn down. Criteria: You must be 19 years of age by July 1, 2014.  You must be able to attend all rehearsals and other related activities. The auditions are also closed to the public for viewing. If you are invited to stay for the semifinals, you will be performing the routine in smaller groups for the judges. Those being invited to our 2014 training camp will be notified by noon the following day. 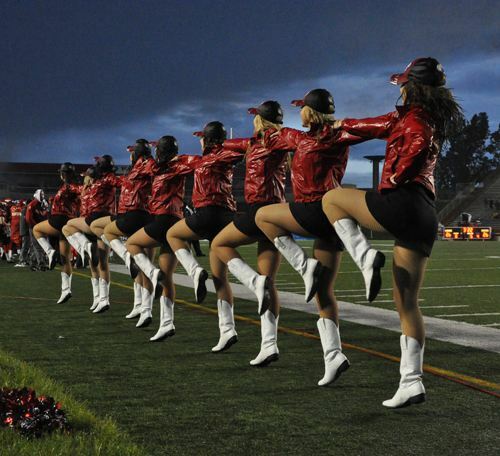 The Calgary Stampeder Outriders at last weekend’s PinkPower game in support of Breast Cancer Awareness. 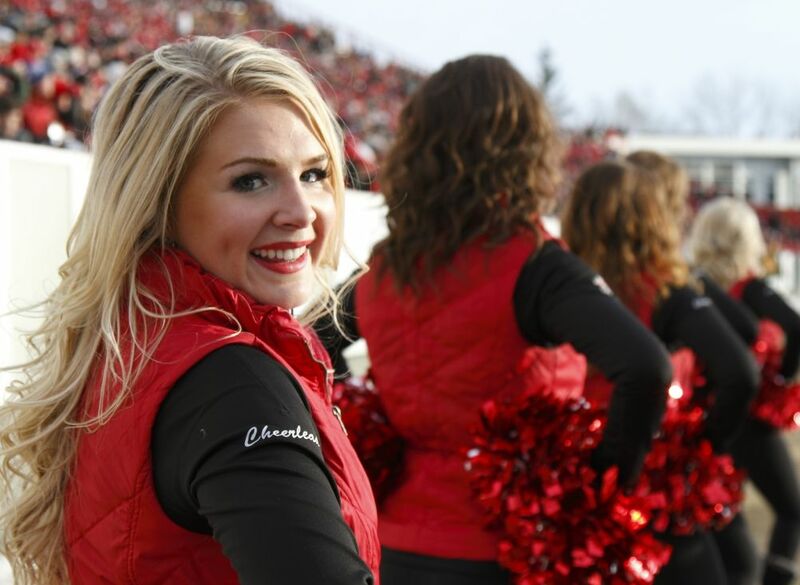 At the Calgary Stampeders home opener against the BC Lions on June 28th, the Outriders debuted their new uniforms designed by Angela King designs. 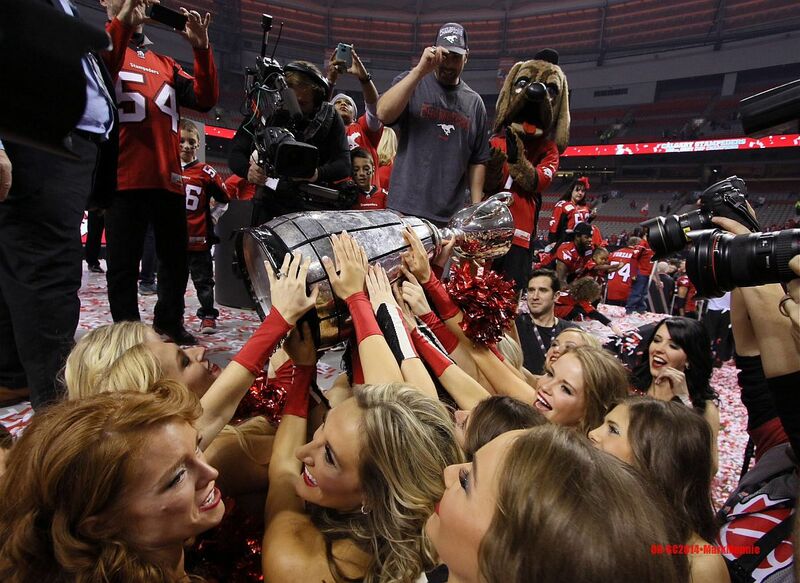 The Stampeders won the game, and during the game the Stampeders and fans raised over C$100,000 for flood relief. 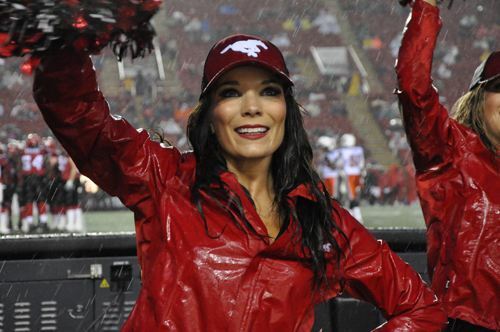 The Calgary Stampeders Outriders got off to a very wet start at a pre-season game against the BC Lions this past Friday. Time: Check-in: 5-6 p.m., Preliminaries: 6-8 p.m., Semifinal: 8-9 p.m.
Attire: Half top/bra top, short dance shorts (hot pants), dance shoes or runners. Wear hair and make-up as you envision wearing it on game day. Hair must be worn down. You must be 19 years of age by July 1, 2013. You must be able to attend all rehearsals and other related activities. Please arrive with enough time to warm up on your own before the audition. 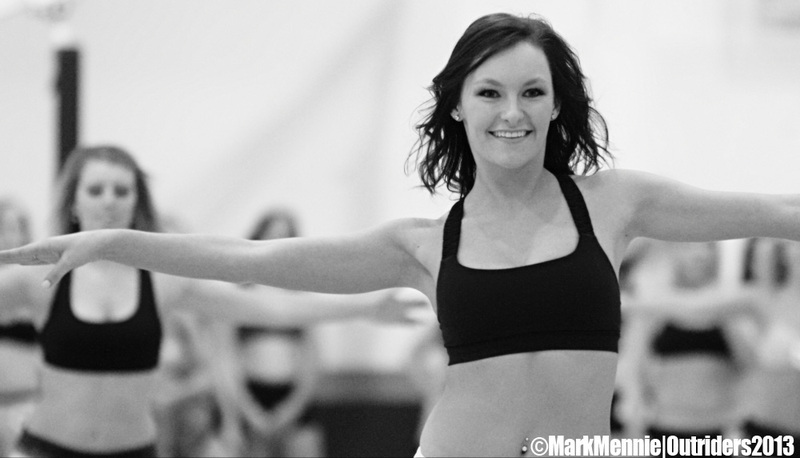 We will start with some across the floor exercises, including but not limited to: walks, high kicks, jete and pirouettes. If you are invited to stay for the semifinals, you will be performing the routine in smaller groups for the judges. Those being invited to our 2013 training camp will be notified by noon the following day.